Funni has a special place she likes to go on Saturdays, an abandoned airport car park where she can see for miles and watch planes take off, play her recorder or fly her kite. After a while she realises that something isn’t quite right with her special place and she sets about changing things, clearing the rubbish away, bringing in sacks of earth and planting seeds. Before long a beautiful, secret garden has grown. But Funni still feels there is still something missing, could this be someone to share her special place with? When a young boy called Zoo, passing overhead on a flight home, spots the beautiful secret garden on the car park roof he decides he has to visit. Funni makes the friend she craves to share her secret garden and her interests too; she finds it is much more fun to fly kites and play music with Zoo than on her own. This is a lovely story about creating natural beauty in the most unpromising environment, building friendship and sharing experiences. 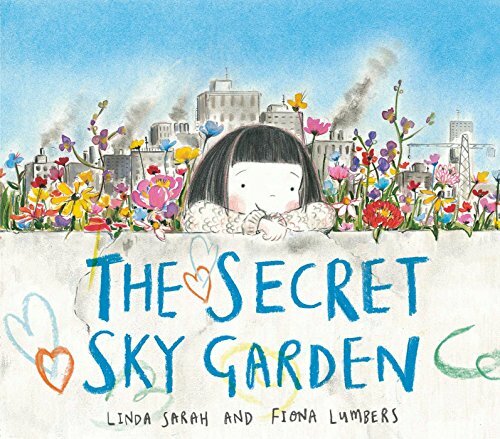 The language is beautiful, the car park was ‘greyer than the Monday sky’, Funni ‘nuzzled’ seeds into the soil and the flowers she grew were ‘bright as an emperor’s blanket.’ The detailed illustrations are gorgeous really showing the transformational effect of the secret garden on the environment and of making a friend on Funni. Her wistful expression when she realises something is (definitely!) missing transforming to one of sheer joy when she has a friend to play with. A delightful picturebook.